October 11, 2017 By Editor & filed under Blog. Stubborn belly fat is a problem that most of us face at one point or another on a weight loss journey. While exercising regularly is one of the best things you can do to manage your weight, that’s not the end of the story when it comes to trimming your waistline. There are various factors that can specifically contribute to excess belly fat, or make it hard to lose belly fat it once it’s there. From stress to soda addiction, it’s time to examine your daily habits to see what could be hurting your health and your waistline. Use the tips below to get rid of stubborn belly fat and then get to work toning the muscles underneath with the ab workouts on Get Healthy U TV! 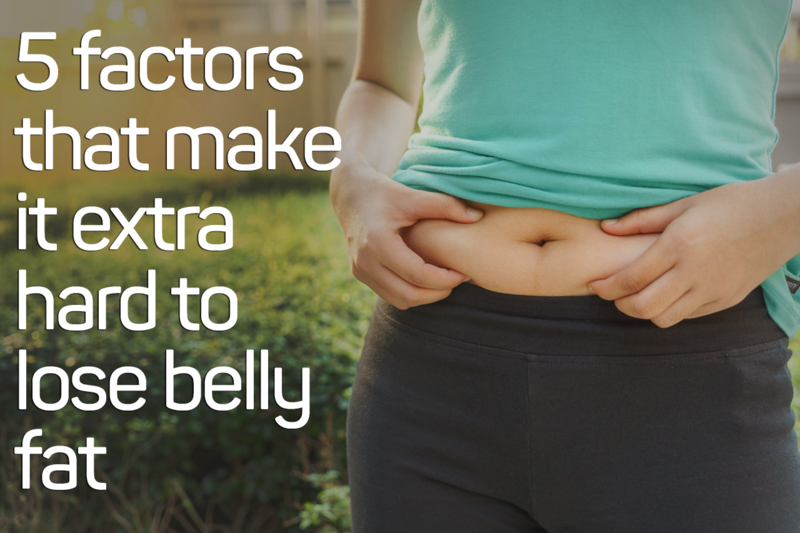 Did you know that stress and belly fat are connected? The more cortisol your body produces (the stress hormone), the more your body tends to store fat around your middle. Kind of surprising, right? Manage your stress with exercise and daily meditation or reflection. Taking a few minutes to unplug from technology and obligations each day and tune into your breath can help you de-stress—which is not only good for your mindset, but your belly fat. During menopause and the years leading up to menopause (perimenopause), hormonal fluctuations can cause a whole host of problems, from night sweats and insomnia to mood swings and weight gain. Many women find they gain weight specifically around their middles during this time as decreasing estrogen levels can cause fat to settle around the belly. You can learn how to balance your hormones to help lose belly fat by reading this article or talking to your doctor about what you can do to balance your hormones naturally. Some women find that taking Wild Yam, cutting back on red meat, or eliminating excess sugar helps bring their hormones back in balance. Sometimes losing stubborn belly fat is primarily about getting honest with ourselves about what we eat. Maybe you exercise daily, but if you’re not also eating a healthy diet, you won’t see any results. While calories are not the only thing that matters, it is part of the equation. If you want to lose weight you have to consume fewer calories than you burn—that is just a fact. But you also have to eat quality food—lots of veggies and fruits, some lean protein, whole grains, healthy fats, and occasional dairy. Keep a food journal for a few days to really get honest about what you’re consuming every day. When your body is sleep-deprived, two hormones in your body—leptin and ghrelin—get thrown out of whack. These hormones affect how satiated you feel; when you’re sleep-deprived your body physically starts to feel hungrier and it takes more to fill you up. You’re also more likely to crave sugary or fatty foods to give you energy. Aim to get a solid 7 to 8 hours of sleep every night to feel your best and keep belly fat from accumulating. Being healthy isn’t about just what you eat—what are you drinking? If you’re having wine every night or love your daily soda, those are empty calories that are likely contributing to weight gain around your middle. Try swapping soda for sparkling water or add some slices of cucumber, lemon, or a bit of mint to plain water if you want a bit of flavor. Cutting back on alcohol will also help you trim your middle, too! Examining these daily habits can help you identify what’s making it harder to lose stubborn belly fat. Replacing them with healthier options will not only give you a leaner stomach but also boost your overall health. Hello, I was wondering if I could get some suggestions for my daily workouts from you. I’m a gold member and have been for two years now. Unfortunately, last December I got frozen shoulder and I’m still dealing with the pain of it. I’ve been seeing a shoulder doctor, received a cortisone shot to help with the intense pain, having acupuncture done once a week, seeing a chiropractor weekly, physical therapy three times a week, massages and seeing an AIRROSTI doctor on a weekly basis. I am just now able to get some of my range of motion back and would really like to get back to my workouts. I cannot do weights with my arms and I cannot do push-ups or planks yet. There are so many videos from which to choose and I can’t view all of them to see how much shoulder work is involved. I was hoping I could get a quick list of workouts you’ve done that are easy on the shoulder while I get my shoulder movement and strength back. Thanks for you help. Hi Jenae. Thanks for reaching out. Sorry to hear about your shoulder injury. That can be a very frustrating thing to be sure! Many of our workouts do include the entire body as we seek to provide balance of all muscle groups. The first thing I would suggest is to choose ANY workout that looks fun to you and if a shoulder exercise, push-up series or anything else comes up that you are unable to do- just modify! Take time during the push-ups to run in place or do extra squats. SKip the shoulder press and use that time for reverse lunges. This kind of swapping will allow you to do more variety and learn how to modify. Also we have several Walking Workouts many of which do not use weights! I hope this is a good start for you. Like I said, you can really try many more workouts and substitute for the things you can’t do.